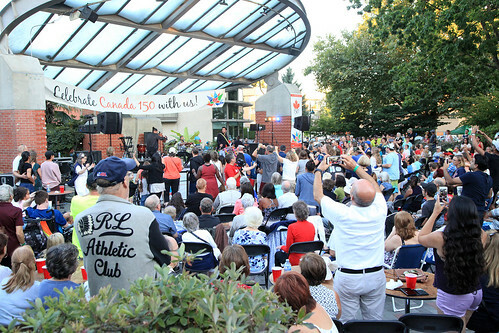 Almost 9,000 people joined us Aug. 26 for Canada 150: Celebrate Our Journey – a free arts, music and nature festival headlined by Vancouver international recording and touring sensations Delhi 2 Dublin. Thank you to all who attended, performed, volunteered, participated and sponsored this great event! Canada 150: Celebrate Our Journey was an amazing day of community spirit, live entertainment, storytelling, food, displays, hands-on activities and more. The day started at Lion’s Park with opening ceremonies at noon, followed by live music and entertainment (including champion Lil’wat Nation hoop dancer Alex Wells), kids’ activities, displays and activities with environmental and community groups, guided nature walks, food and more. Pop-up dance performances in unexpected locations began at 2 pm and 4 pm, leading a procession to Leigh Square with the fun parade band Freddy Fuddpucker. The main event started at Leigh Square at 2 pm and included live music and dance, a canoe display and stories with the Kwikwetlem First Nation (kʷikʷəƛ̓əm), kids’ activities, souvenir photos and stories with PoCo Heritage, food trucks, a beverage garden and more. Event-goers of all ages also painted 400 tiles for the Canada 150 mosaic mural that will be installed at Leigh Square this fall. Headliners Delhi 2 Dublin wrapped up a day to remember in spectacular style, bringing the audience to its feet with their dynamic stage show and mix of bhangra, hip hop and world pop.